Summer is a gloriously happy time of the year but the heat and the sun play havoc not just with our hair but with our complexions as well. In addition to upping our sun protection to safeguard our skin (sometimes it leads to your pores being a bit more clogged than usual, particularly if you re-apply it during the day on the beach, as advised by dermatologists), it helps to switch to lighter skincare formulas but would you use a summer face oil? If the thought hasn’t crossed your mind or you have some misconceptions about them, I have been testing two face oils this summer, Bodhi Neroli Luce Revitalising Face Oil and de Mamiel Summer Facial oil, with great success (my way of saying that those two are definite beauty keepers). Bodhi Neroli Luce Revitalising Face Oil: I have a particular affliction with this brand because it is run by Elijah Choo, a man who is a true visionary with incredible talent, knowledge and constant curiosity that leads to new product launches, each more surprising than the other. This face oil bears promise to ‘revitalise and rebalance your skin with Tunisian Neroli, rejuvenating Frankincense and Restorative Sea Buckthorn Oil’. Face oils can create problems for your skin, if you use an inferior quality one but all Bodhi products are created after rigorous testing and lots of research and development, as Elijah never does things just for the sake of it. This face oil is suitable for normal, combination, dull, tired or blemish-prone skin and it will also benefit you if you have oily zones or dry patches. You can use it in the morning or evening (or both) after you cleanse your face. I add a couple of drops of this bright orange face oil to the tips of my fingers and massage it into my face and jaw line, with upwards strokes, while inhaling its beautiful aroma. The oil sinks in almost immediately and leaves behind a perfect canvas for make-up if you use it in the morning. You can apply it to your face on its own, or after your usual face serum. In my case I have been using it both in the morning and in the evening, just on its own, because my skin found it perfect as it is, even after sunbathing on a holiday in a warm climate. Ingredients: Vitis Vinifera (Grape Seed Oil), Prunus Armeniaca,Apricot Kernel Oil, Simmondsia Chinesis (Jojoba) Seed Oil, Oenothera Biennis (Evening Primrose) Seed Oil, hippophae Rhamnoides (Sea Buckthorn) Fruit Oil, Citrus Aurantium Amara (Bitter Orange) Oil, Boswelia Carterii (Frankincense) Oil, Lavendula Augustifolia (High-Altitude Lavender)Flower Oil, Pelargoneum Graveolens (Geranium)Flower Oil, Cymbopogon Martini (Palmarosa) Oil, cananaga Odorata (Ylang-Ylang) Flower Oil, Benzyl Alcohol, Benzyl Benzoate, Benzyl Salicylate, Citral, Citronellol, Eugenol, Farnesol, Geraniol, Isoeugenol, Limonene, Linalool. This oil also combines vital vitamins and essential fatty acids that will boost your skin tone (I noticed a difference within a couple of weeks of daily use) and rebalance your skin’s natural hydration system. I am a true case in point, as I intentionally chose to use this oil during my summer break in the sun, when I know my skin tends to become drier due to my being in the sun and spending as much time as I can swimming in the sea. Another benefit of using this product is the lesson in geography and education through the ingredients that you will receive. Tunisian Neroli Oil, for example, helps to trigger the growth of new healthy skin cells thus improving skin’s elasticity. Known for its anti-depressant qualities, it also helps to balance our nervous system through its sedative properties and addresses negative emotional conditions. Frankincense is known for its skin regeneration properties and is inherently astringent, so it helps to balance our skin and reduce dryness or oiliness. It also encourages the growth of skin cells and heals wounds, reduces scarring and inflammation process in the skin. Did you know that Sea Buckthorn Oil is revered in Eastern skincare or that Russians love it for its immunity boosting properties and make jam and tea out of this little but very potent and delicious tasting orange berry? It boasts six different fat soluble vitamins, 22 fatty acids, 42 kinds of lipids and 36 kinds of flavanoids and is the richest natural source of Beta Carotene (that’s why it is particularly beneficial when you have active sun exposure) and Omega 7-the combination combats the ageing process of our biggest organ. Grapeseed Oil, which is super-lightweight and is quickly absorbed, encourages our skin to product elastin and Hyaluronic acid, while its high antioxidant content protects our skin against free radical damage. Inclusion of Evening Primrose Oil, with its high concentration of Gamma-Linolenic Acid (GLA)is important because it brightens our skin without clogging the pores and Apricot Kernel Oil (which is rich in vitamins A, B1, B2, B6, B17, E and oleic and linolenic acids and helps to sooth, nourish and condition our skin). Did you know that Jojoba Oil is known for its anti-microbial and anti-inflammatory properties, as well as is a rich source of vitamins, minerals and fatty acids? Its compatibility with the sebum helps to unclog pores. If all those facts don’t make you eager to try this oil, than you are clearly immune to the charms of natural beauty. 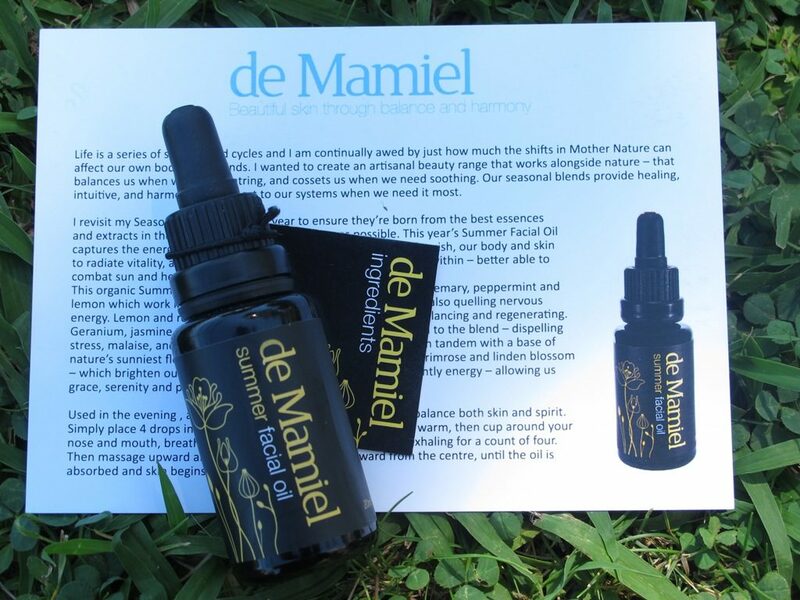 De Mamiel Summer Facial Oil: Annee de Mamiel creates wonderfully potent seasonal face oils and I am already a big fan of her Spring oil, as well as the Altitude Oil, without which I never leave on my travels. She ‘revisists’ her Seasonal oils every year in order ‘to ensure they’re born from the best essences and extracts in the world, and are as potent and pure as possible’. This desire was made stronger by Annee’s serious illness in 1998, so she made it her mission to find holistic solutions for healing and supporting the skin. This year’s summer oil-a gentle, light yellow in colour-‘captures the energy of nature in full bloom-encouraging us to flourish, our body and skin to radiate vitality, and our skin to become strengthened from within by better combating sun and heat exposure’. This particular oil blend combines essential oils of rosemary, peppermint, may chang and lemon that work in harmony with each other by helping you feel cheerful, while also calming down the nervous energy that we all experience on a daily basis. I always think of summer as the season that allows us to exhale and have innocent fun in the sun, clear our heads and prepare our minds for the changes that autumn brings with it. Lemon and rosemary are known for their anti-oxidant, balancing and regenerating properties, while geranium, jasmine and patchouli oils add their grounding qualities to the blend by helping to de-stress our bodies and balance unsettled hormones. The combination of oils in this blend work together with the base of nature’s sunniest flower essenceschamomile, sunflower and linden blossom-which help to brighten our disposition and fill us with energy, while also leaving room for grace, serenity and spontaneity. Naturally occurring – patchoulol; bulnesene; guniene; citronellol; geraniol; linalool; 1,8 cineol; pinene; camphor; myrcene; citral; limonene; citronellal; menthol; menthone; menthyl acetate; Flower essences of chamomile, hawthorn berries, linden blossom, scot’s primrose, sunflower, stargazer lilly, california wild rose, handel rose. The best way to use this oil is to add four or five drops from the dropper to the palms of your hands, press them together to warm the oil with your natural bodily heat, then inhale its aroma through nose and mouth, breathing deeply for a count of three and then exhaling for a count of five. Then you massage the oil upwards, from the jaw-line up and all over your face with the gentle, circular notion, working outwards from the centre. This whole little evening ritual grounds me and adds a peaceful, serene smile to my face, while calming my whirly mind. The oil sinks in almost immediately and adds radiance to my complexion. I also feel that this oil is very special because it also contains flower essences, so the oil works not just on your face but your body and mind as well, allowing you to look beautiful and feel happy and serene at a close of each day.